The Druids follow the seven Precepts of Merlin and the Guiding Virtues of Honour, Truth Justice, Faith, Hope, Love and Benevolence (phoenixmasonry.org). The Ancient Order of Druids began in its modern form in 1781 in England. The Druids incorporated several different Orders including the United Ancient Order of Druids, the Ancient and Venerable Order of Druids, the Order of Druids and the Loyal Order of Druids. Meetings followed a programme which included drinking, toasts and singing of songs. According to the Druidic Dawn website Druids were very fond of both the drinking and the singing! While Druid lodges flourished in the 19th century the Order of Druids has ceased to exist as a fraternal society and is now a financial service however the United Ancient Order of Druids Grand Lodge of Australia is located in Melbourne and still has active Orders throughout Australia (Druidic Dawn). The first Ancient Order of Druids in Australia was established in Newcastle by Joseph Wagdon, who was also District Master of the Hunter River District Grand United Order of Oddfellows. Like all Friendly Societies, members were entitled to payments for medical expenses, sickness and death benefits. By 1867 there were ten Newcastle lodges with about 1,200 members. By the 1880s there were nearly a dozen lodges in the Lower Hunter Valley. Loyal Friends in Need Lodge, Borehole No. 99 registered in June 1870. John Dewer, a 23 year old coal miner died of injuries after a mining accident on 7 February 1865 at the Wallsend Colliery. He was a member of the Order of Druids from the Young Man's Friend Lodge No. 988. The Lodge provided a funeral for him with full Masonic Honours and he was buried in Old Wallsend Cemetery (Newcastle Chronicle). Druid Orders existed in Newcastle as early as 1880 when night processions were witnessed at Minmi "two abreast, all with long white beards, with faces turned green with some sort of powder, and carrying flaring scrub torches" (Fraternal History). In 1905 a women's Lodge was formed in West Wallsend called the "Pride of West Wallsend". During the First World War a Roll of Honour was erected to twenty-two members of the Pride of Kurri Kurri Lodge U.A.O.D. No. 487 who were on active service. This number represented twenty-two percent of their members, the highest percentage of any Druid Order in the State. In 1919 David Puller died in Cessnock, he was the oldest Druid in Newcastle having been a member of the Order for over 50 years (Maitland Mercury). 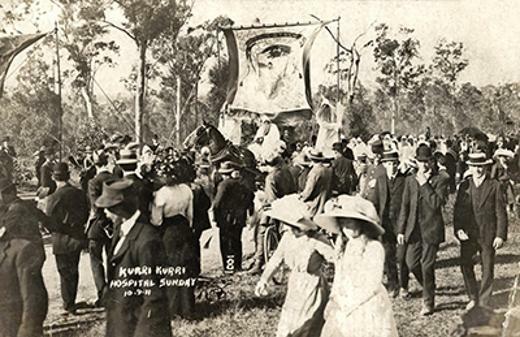 The Druid float was popular at the Kurri Kurri Hospital Sunday fundraising procession in the early 20th century, where some Druids marched in full formal regalia or wore long white robes with flowing beards, while others rode on horseback beside the float. Druidic Dawn.org. "Druidic Orders." Web. 25 Mar. 2013. Fraternal Secrets.org. "Some Australian Druid History." Web. 25 Mar. 2013. James, Bob. They Call Each Other Brother, Secret Societies and the Strange Slow Death of Mateship in Australia 1788-2010. Tighes Hill, NSW: B. James, 2010. Print. "Notices." The Maitland Daily Mercury. 24 Aug. 1916. Print. Phoenix Masonry.org. "Ancient Order of Druids." Web. 25 Mar. 2013. "Wallsend." Newcastle Chronicle. 8 Feb. 1865. Print. "Wallsend." Newcastle Chronicle. 11 Feb. 1865:60. Print.